A new University of Stirling study has uncovered the secrets of 'pollen thief' bees - which take pollen from flowers but fail to act as effective pollinators - and the threat they pose to certain plant species. Flowers often need pollinators, such as bees, to collect and transport pollen to fertilise other flowers and trigger fruit and seed production. In order to attract pollinators, flowers offer resources such as nectar, oils, and pollen in return. However some bees act as thieves by taking the pollen - a vital protein source for young bees - without providing pollination services. Even plants which have adapted to the threat they pose can suffer from extremely high levels of pollen theft, according to the study. Dr Mario Vallejo-Marin, an evolutionary biologist at the University of Stirling and senior author of the study, said: "It’s a co-evolutionary arms race between plants and bees. Some plants have fortified structures called anthers, where pollen is locked up behind a thick wall. The only way to open these 'pollen vaults' is through small pores at the tips. "However some species of bees, such as bumblebees, have adapted to produce high-frequency vibrations to counteract this and get at the pollen, a process known as buzz-pollination. "Looking at a buzz-pollinated plant called buffalo-bur, we found that more than 80 percent of bees visiting its flowers collected pollen but failed to contact the female floral parts, therefore contributing little, if anything, to seed production." Although nectar theft among bees is well-known, little research has been carried out into the prevalence of pollen theft, or the factors which determine whether a bee will become an effective pollinator or a pollen thief. The study showed that showed that bees which act as pollen thieves are smaller, stay longer at each flower and visit few flowers in each run. Legitimate pollinators tend to be larger, buzzing bees which visit many flowers in many plants and are likely to help plants spread their pollen more widely. Co-author Lislie Solis-Montero said: "The bee’s size is the key determinant of whether it will be a pollen thief. The flowers of buffalo-bur work as a ‘lock-and-key’ mechanism to ensure that the bee collects and deposits pollen with the right body parts. Bees which are too small fail to contact the female organs, while still taking away pollen grains to feed their larvae." The study was carried out in Mexico, where the introduced European honey bee was found to be a particularly common pollen thief, which could have important repercussions for buzz-pollinated plants in areas where honeybees compete with native bees. Dr Vallejo-Marin said: "If honey bees are displacing native pollinators, the reproduction of this and other species of buzz-pollinated plants may be compromised. "The decline of natural populations of bees around the world, combined with the expansion of non-native pollinators, could have important repercussions for the evolutionary future of specialised, buzz-pollinated plants." The research, published in the journal Arthropod-Plant Interactions, was carried out with colleagues from the University of Puebla in Mexico. Media enquiries to David Tripp, Communications Officer, on 01786 466 687 or david.tripp@stir.ac.uk. 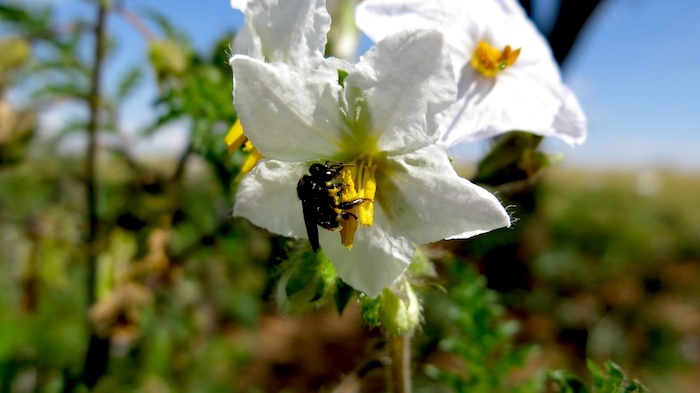 The report, entitled 'High incidence of pollen theft in natural populations of a buzz-pollinated plant', was published in Arthropod-Plant Interactions.